Then we met up, for the first time, with blogging friend Sybille, and her son Ben. We had a lovely couple of hours together chatting, looking in the museum shop, having tea and cake. 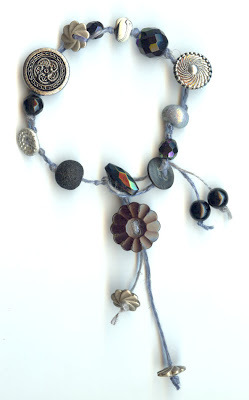 Sybille was wearing one of the hemp, bead and button bracelets I made her. You can see them in the pics here, one in slate greys and blacks, the other in greens, to match the lariat necklace she has already. I made these myself !! not Toby, though they are in his style. Toby and I decided that I had had enough 'jewellery payment' for the moment, and I'd already agreed to give Sybille 2 hemp bracelets in part payment for a green scarf she is knitting me, so I had to make them myself ! The first image here is of a beautiful black crochet wire necklace that I bought from Sybille when we met, I wore it all day, and out that evening for dinner with my Dad! 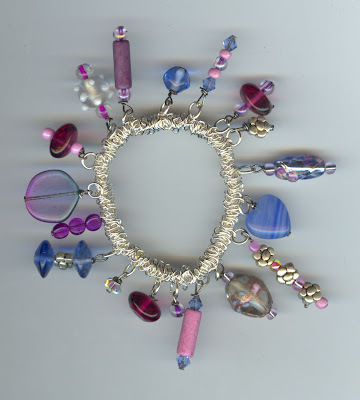 Sybille makes the most wonderful creations, have a look on her blog: http://magpiemagic.blogspot.com/ Have a scroll down to 'New Crochet Collection' posted 12 April, and you will also see the necklace, bracelet, and earrings set that I also bought, named 'Scheherazade'. The pieces are so delicate and even more lovely in real life! 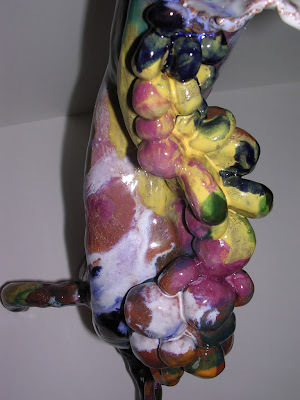 On Friday I recieved a WONDERFUL package from Debs at www.theimaginationofladysnail.blogspot.com . 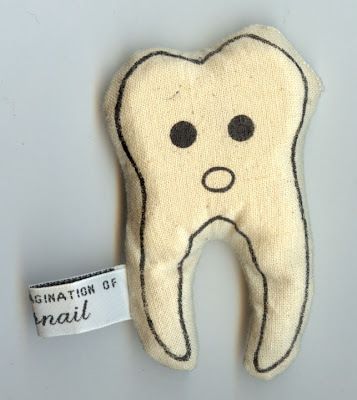 It included a gorgeous little handmade tooth, a packet of millefore fimo beads, and absolubtely bag-loads of buttons!!!!!! 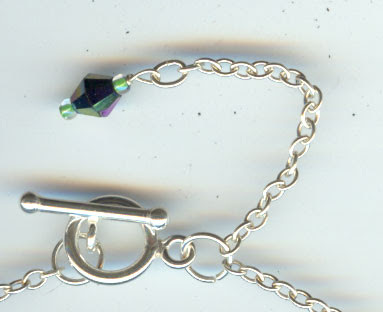 This beautiful little necklace is unusual as it has two chains, one in gunmetal and the other a fine sterling silver. 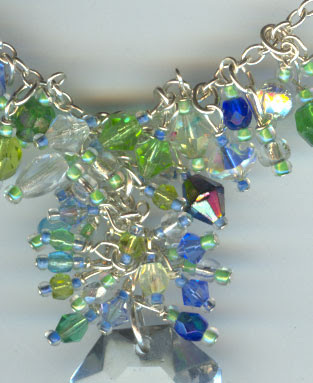 The centre piece is a delicate cluster of pretty faceted crystal beads. 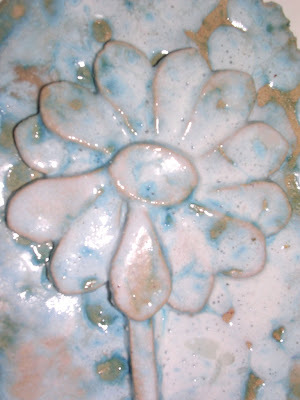 A little blue and white ceramic flower plaque, made from buff stoneware clay, and glazed with white earthenware and persian crackle. Wood and glass for sale! 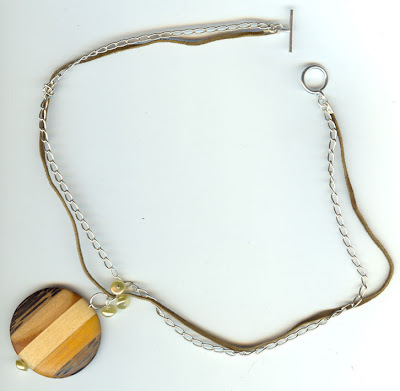 Firstly, a brown wooden striped pendant, strung with pearly beads on brown suede and solid silver chain, with a sterling silver toggle clasp. 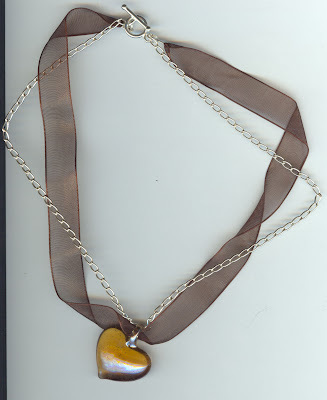 Secondly, an amber coloured glass heart, strung on brown organza and solid silver chain, also with a sterling silver toggle clasp. Pretty white gift boxes available for anyone wanting to give these as a present. 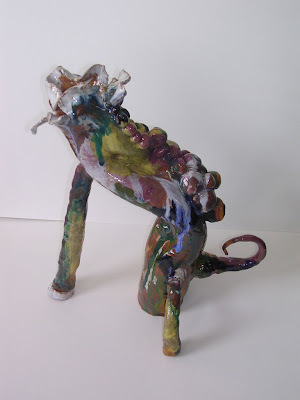 This is Toby's 'Dragon' he made at his ceramics class, it stands about 15 " tall, I imagine it holding a single lily for a head, or perhaps a hyacinth, like Marge Simpsons hair! 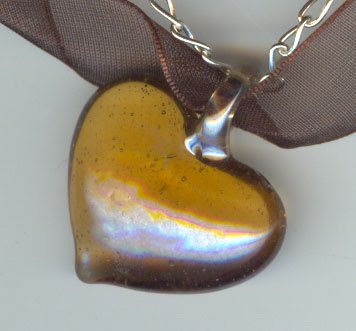 Toby went down to town this weekend to see http://www.makepiece.com/ this is the shop that stocks his 'Attrills' range of jewellery http://www.attrills.blogspot.com/, and great news, 'Adaline necklace', as seen above, has sold! 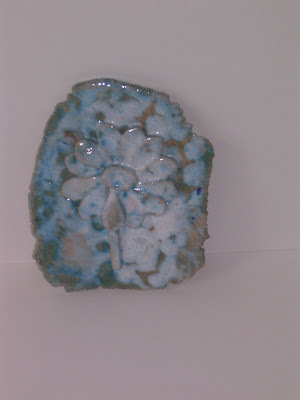 A piece of water washed blue and white ceramic hangs from 2 sterling silver chains along with vintage glass buttons and beads, and it is named after my Mother. I wonder who bought the necklace. Apparently months ago 2 sisters came into the shop and both liked 'Adaline bracelet', one of them bought that, I wonder if she came back for the necklace, or perhaps it was her sister, or maybe somebody completely different, I guess we will never know. 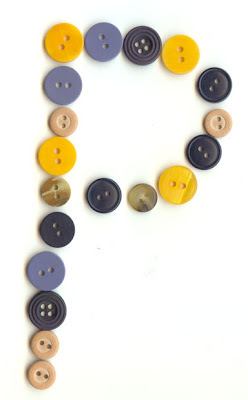 Thank you for the buttons Lucy! I have named this post 'WOW !!' because that's what I think! 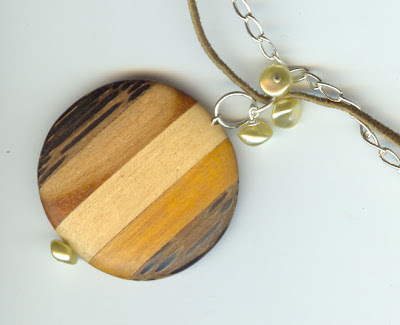 This is a necklace Toby has just finished making, it has taken him hours and hours to design and construct, and it is absolutely stunning! 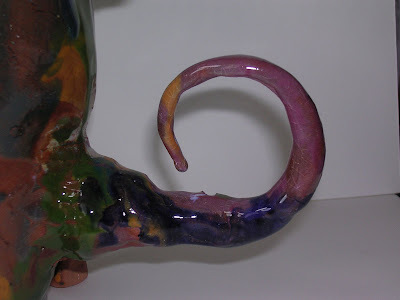 I have pictured it whole, then picked out all the details for you to see, and finally on a darker background to show off it's unusual and contemporary asymetrical shape. 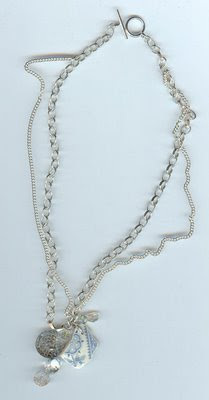 The chain is solid silver, purchased new, from a Birmingham silver manufacturer, and all the findings are sterling silver. 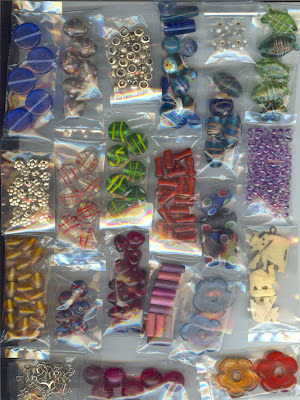 Some of the beads Toby has purchased new, beautiful tiny seed beads, and shimmering Swarovski crystals. 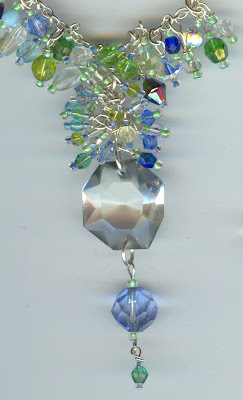 There are also vintage crystal beads, for example the large clear faceted bead hanging from the chain to the side, and the pretty blue one which dangles beneath the hand cut antique glass chandelier pendant. 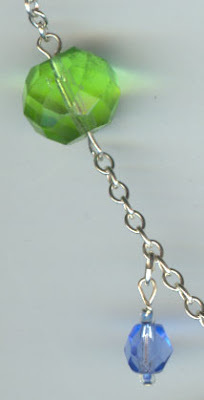 Hand linked into the main chain is my favourite, a large green crystal bead reclaimed from a 1940's necklace we bought at Halifax Antiques Centre. 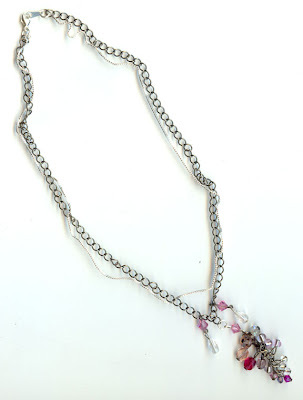 The necklace has a sterling silver toggle clasp and a pretty little chain with beads to finish it off at the back of the neck. If you study the close up picture, 5th from the top, just above the large centre glass, you can see all the beautiful tiny beads that Toby has individually chosen for their colours and lovingly wired together with silver headpins and findings, such alot of work! 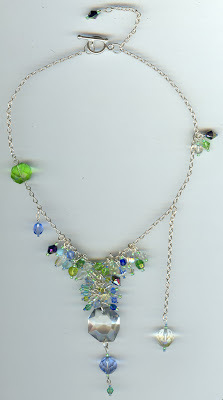 This is a unique necklace, and it sits beautifully on the collar bone of the wearer. I hope it goes to an appreciative home. 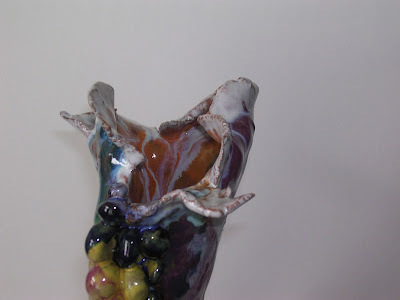 It is for sale at £35 plus postage and packing, which, if you think about the time and effort, materials and unique elements gone into this piece, I think it is a bargain!! Also, as always, commissions taken. 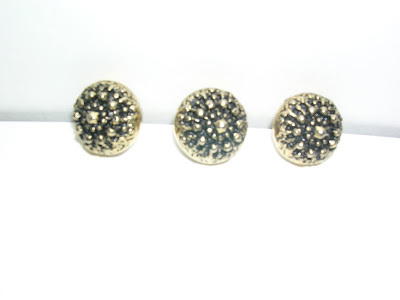 This has been a very busy weekend for me, With cakes, friends and jewellery! I have recently had 2 repair jobs from local people, one was my first ever 'proper' customer, that i don't know! 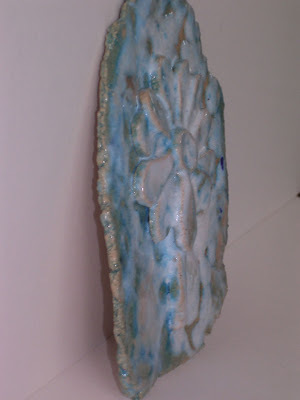 The other one was one of my Mum's friends, who had a turquoise and silver necklace that badly needed a good clean and re-stringing. 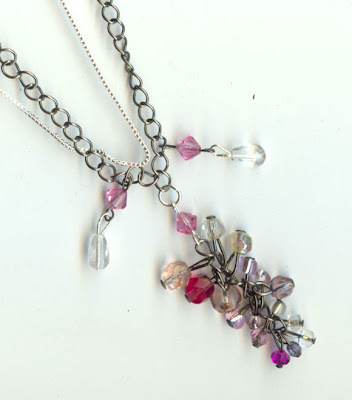 A tip for re-stringing is always photocopy or scan the original necklace first so you can remember the layout. 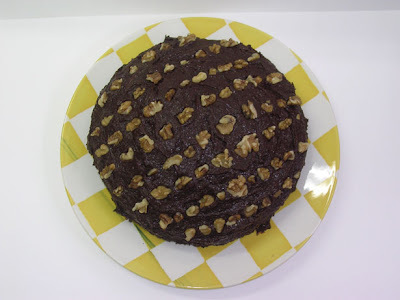 We iced it this morning with chocolate butter icing and strawberries, raspberries and walnuts. 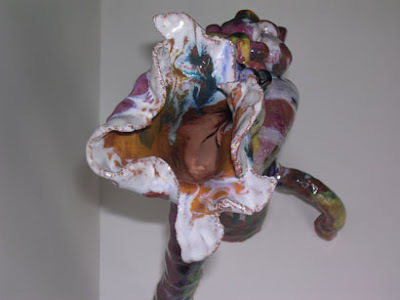 If you look carefully at the photo you can see a sort of flower! The yellow and white platels round the edge and the walnuty seeds in the middle! Tonight my friend Joseph is coming over for the night. We have an industrial size bucket of haribo (sweets)!! 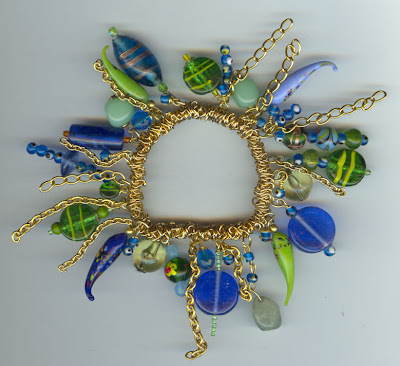 Here is a beautiful piece that Toby has made, it is a gold plated stretchy bracelet, so fits most sizes. 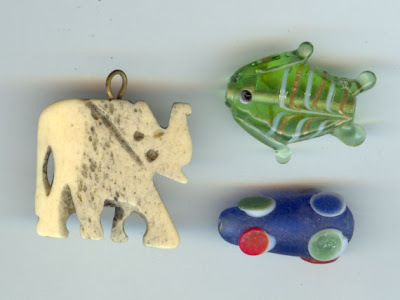 He has used a few of the beads that Maya gave him, and also some little ones from Caroline (thanks guys!) 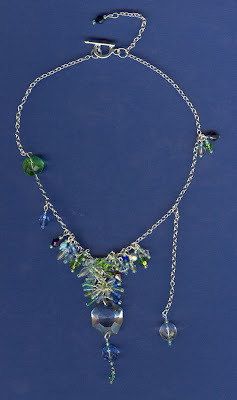 but mostly it is made from a collection of his own treasures, all put together in a greeny blue theme. 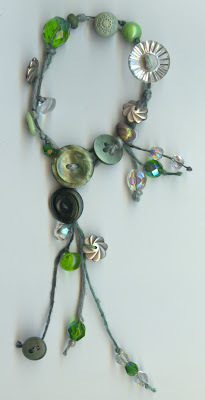 He has combined different beads onto head pins and linked them together along with some glass chilli charms he bought on the internet, dotted between various lengths of reclaimed chains. 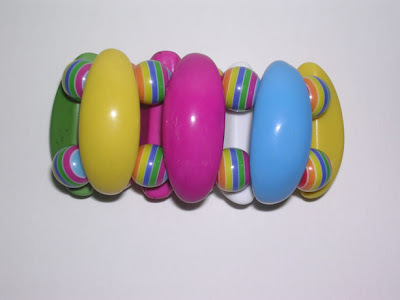 It is quite a chunky bracelet full of beads with lots of movement when worn. 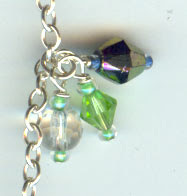 Commissions taken for other colour combinations, prices vary depending on amount of beads. (see a few local views along the canal: http://www.ealees.com/walks/todmorden.html ) we have had some blogging visitors! It was lovely to see Gretel (http://allaroundus.blogspot.com/) and her family, who very kindly made an hours journey to visit us on Monday. Then yesterday, Lucy (http://life-of-pea.blogspot.com/) came here for the day to help me with Adobe Photoshop for my illustration work (www.omniadesigns.com), it was great to actually meet in 'real life'! 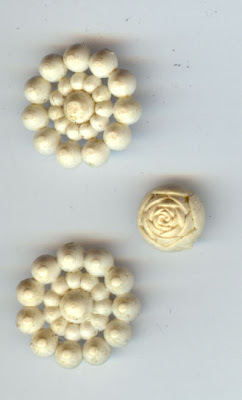 http://karenjinks.blogspot.com/ along with a suprise present of more lovely buttons and beads, you can see 4 of them in the pic above, thank you Karen !! 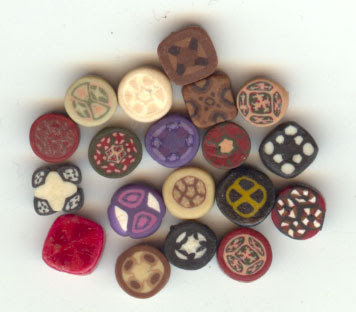 A few days ago we received an absolubetely marvelous package, FULL TO THE BRIM with gorgeous beads from the wonderful Maya, at www.thecolourbox.blogspot.com . 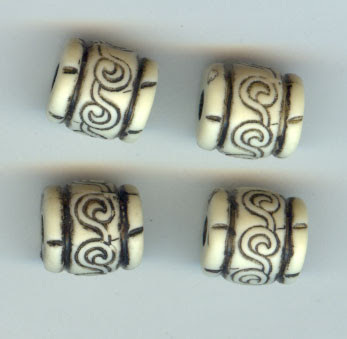 On the second photo you can see a close up of some of the nicest beads, and on the last photo you can see a bracelet which i made from some of Maya's ex-beads!